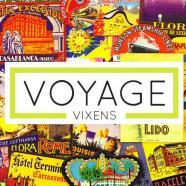 A not-so-funny thing happened on the way to the airport… I didn’t go on the Voyage Vixens trip to Scotland. And not because of my irrational fears of ebola. As many know, and as many followed along on Facebook and twitter, the few days before my scheduled departure were a doozy. Nothing major, but as things go, lots of little things at the same time feel major. Of course, it can always be worse, and it’s important to keep things in perspective – if you have your health, your family and loved ones, a roof over your head, food on the table, it’s not so bad. But sometimes we lose a little perspective among chaos. This time, however, it was less about losing perspective as it was about gaining perspective. Travel anxiety is a very real thing for me that developed – and worsened – over the years. I used to love the adrenaline rush of going to the airport, smelling the smoky aromas of jet fuel, seeing the departures board change, getting on the plane, settling into the flight, and then several hours later landing in a new place for what was always a transformative adventure. But eventually, there were enough bad experiences while traveling that fears crept in. There was the time lightning struck the plane and we dropped thousands of feet; there were at least four flights with turbulence so bad people were praying out loud and saying their final rites; there was the time I was stuck on the tarmac at Newark for four hours with a mechanical problem, no water, no food, and no air in 85-degree heat; the time I missed Christmas because a flight was cancelled due to an engine problem; the time a man had a heart attack on the plane two rows away from me 8 hours into a 15-hour flight from Tel Aviv to LAX; the time a lady had a stroke on the plane two hours into a flight to Hawaii which caused us to turn back, land at SFO, change planes, and start again (14 hours to get to Honolulu in the end)… and even more that I’ve blocked out. I have found ways to deal with my travel anxiety, and have now dealt with it for years. I know what I need to do in order to fly and travel as peacefully as possible. I bring my Yogi calming tea, I give myself a facial onboard, I use lavender oil incessantly, I say my prayers (sometimes several times over and over when there’s turbulence), I listen to music, and when all else fails, I sleep. People sometimes find it hard to sleep on planes — that’s one thing I have going for me. When the anxiety is at its height, my natural psychological response is to detach. So I sleep. I also pack a small pharmacy. I bring Cipro, Zithromax, Tums, Omeprazole, Advil, Dramamine, Immodium, Anti-Nausea meds, Airborne, Emergen-c, Oreganol, Grapefruit Seed Extract, and a few others. My body is sensitive and I’ve been sick on trips numerous times, so I take all precautions now. Food and drink that my body isn’t used to, lack of sleep, changes in weather, and stress are all a recipe for me to get sick. Some have iron clad stomachs and warrior immune systems. I just don’t, and never have. The other thing — the most important thing — is that before a trip, I have to be organized. This means my life needs to be as in order as possible. Bills paid, deadlines met, work finished, dogs happy, home clean, calls returned, family good, my will updated (not a joke), and bag packed (at least a day ahead of time). It may all sound a bit crazy, but this is how it is for me. Exhausting, yes. But the more peace of mind I have, the better. Now, the week leading up to the trip to Scotland did absolutely nothing to help matters. Blame it on Mercury Retrograde? I had some serious technological problems with my computer and phone. My hard drive crashed, and I lost two weeks of data including a story I had a deadline for that Monday which was not backed up. Two iPhones had to be replaced, one with a hardware issue, the other with a software issue. Fire alarms were going off in the mall on my third visit to the Apple Store, and I’m being absolutely literal. Because of those hours lost, I did not have time to get all my work done. I had to rewrite my story from a blank document and retrace my source material. I didn’t fulfill all my pre-trip rituals. And to add to the chaos, a water pipe valve in my backyard broke the day before and was creating a muddy mess that short-circuited the yard lights. I asked my mom if she could please take care of this while I was gone. Not her responsibility, but I was asking for a favor and she willingly obliged. All in all, I didn’t feel very balanced. Ebola was freaking me out, too. I told myself that the media was blowing it out of proportion. I listened to everyone who said, “nah, you’re fine. It’s serious, but you will be fine so long as you stay out of West Africa.” I packed surgical masks, rubber gloves, and extra sanitizing wipes and gels just in case. A representative from the Gas Company shows up my door. Long story short, my charming 1930’s bungalow of a house that has been one project after another, was now responsible for gas leaking under the street thanks to a shoddy cover made of wire to cover the crawl space so rodents wouldn’t get under the house. Gas company left and said, so long as I leave that cover off and find some other way to protect the crawl space (anything but metal), it would all be fine. In tears and overwhelmed, I called in for help. A handy friend came over and put a temporary fix in place, but it wasn’t a solution. It was a band-aid until I could get a contractor or builder out to build a proper cover. Again, my choice was to ask my mom to deal with another problem while I was away, and it just seemed unfair to leave her and my dear friend/dog sitter to deal with my house issues. The stress made me break out in hives; a nice rash appeared all over my face and neck. I’d lost my Zen. I debated and debated, was torn in fifteen different directions, knowing that no matter what I did, I was going to disappoint. If I went, I’d fulfill my commitment to Lanee and the story potential, at the risk of being not fully present while there, knowing that I was leaving a mess of chaos at home for others to deal with. The guilt crept in. Then came the impossibly challenging thought that if I didn’t go, I would disappoint a friend who’s like a sister to me and a business partner whom I respect, not to mention upsetting the tourism boards I’d been working with to get there in the first place. I risked Lanee being furious and not understanding my quandary, and appearing unprofessional despite the challenges I was dealing with at home. What are people going to say if I don’t go? Things happen. This isn’t the first time someone’s had to cancel last-minute, I told myself. You have to do what’s best for you. Anxiety central. I’m going. I’m not going. I have to go. I can’t go. The clock was ticking. My flight was in 4 hours. I had to make a decision. In the end, I cancelled the trip. I suffered the temporary financial loss of the flight, but was able to reinstate my air miles. Bottom line – the universe had spoken loud and clear to me, and confirmed it the next day when I woke up to no power, no gas, and no hot water. First world problems, some might say. Indeed. However, that doesn’t lessen the stress and challenge that such a scenario creates. Though not her responsibility, could my mom have dealt with it all? Sure. But managing a stressful home utility and plumbing emergency from halfway around the globe is hardly my idea of a good time. In the days that followed, I felt extraordinarily disappointed. I felt like I let all the chaos and emotion get the best of me. And I unravelled. It made me think about the bigger picture and what all of it meant. What. am. I. DOING? What do I want? Why is this happening? I’d spent the last several years traveling all over the world. It was a dream job. And then at some point, it became just a job. Travel wasn’t fun any more. I wrote a post several months ago about travel burnout. Am I not over it yet?, I wondered. Everything felt like an obligation. Again. I resented every emotion I was experiencing from all ends of the spectrum and I didn’t understand any of it. I was exhausted. The week that followed, I took care of things at home. I stayed off social media for the most part for reasons I’ll explain in a later post. I knew Lanee was furious and didn’t fully understand no matter how I explained it. I also knew that a big conversation between the two of us was going to have to happen upon her return, as she and I both knew — this was more than the cancellation of a trip. And just like that… the non-trip cemented the fact that a new voyage had already begun. ** Have you cancelled a trip at the last minute? What happened? What did you learn from it? We’d love to hear about your experiences – comment below!